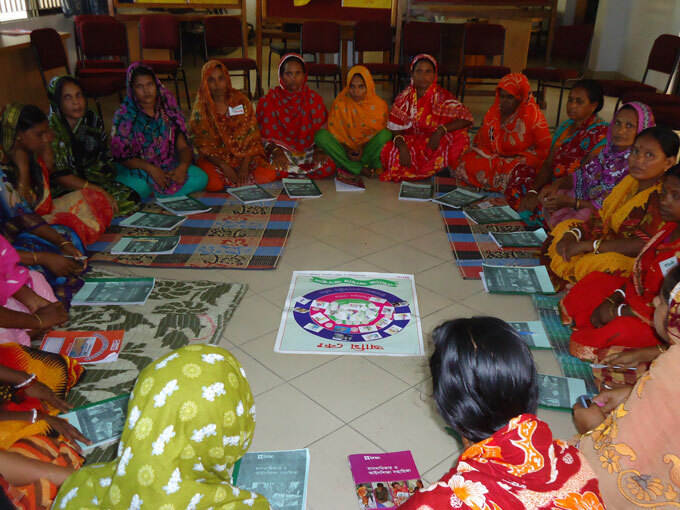 An innovative approach to legal and human rights education targeting grassroots communities across Bangladesh was recently developed by BRAC’s Human Rights and Legal Aid Services (HRLS) programme. This effort is steered by BRAC’s continuous journey to improve its existing services and ensure positive impact on human development activities. The new HRLE 12-day course, learning to rediscover one’s potential. BRAC HRLS’ legal literacy component, Human Rights and Legal Education (HRLE), was introduced in 1986 after BRAC expanded its focus to the critical consciousness of the poor, aiming at sensitization regarding the causes of exploitation. The HRLE module consisted of a 22-day course where knowledge of basic laws relating to dowry, marriage, child marriage, divorce, land, and other topics are imparted to grassroots women around the nation. With this knowledge, poor and vulnerable women can protect themselves from exploitation and discrimination within the society and can also help quell human rights violations from taking place. As of March 2013, a total of 3,794,398 women received the Human Rights and Legal Education (HRLE) course. Barefoot lawyers, known in Bengali as shebikas, teach the HRLE classes. The shebikas are critical leaders and key access points within the community who make legal representation and awareness building sustainable. Up until now, 6,065 HRLE shebikas are volunteering with HRLS. As most students are illiterate, barefoot lawyers use a simplistically illustrated flip chart as a tool in their legal literacy classes to deliver course content from the HRLE curriculum. The classes are taught on an hourly basis every day of the week. The shebikas travel from one village to another in assigned regions countrywide to conduct these sessions. They receive a total of BDT 35 per participant and teach a group of 22-25 women per class. HRLE gives course participants the opportunity to put their legal literacy skills into practice. After the completion of the HRLE course, three of the best students form an Odhikar Bastobayon Committee (OBC) or Rights Realisation Committee. These groups act as grassroots-based human rights advocates as they assist in preventing rights abuses that occur within their immediate communities. Designated HRLS field staff regularly visit the HRLE classes held within the proximity of their work stations to monitor the performance of the barefoot lawyers, interact with participants, and ensure effective use of class content and time. Daylong and yearly refresher training for HRLE shebikas are conducted by a cohort of HRLS field-based trainers. The former are held at either BRAC’s area/branch offices and the latter are conducted in BRAC Learning Centres (the organisation’s nationwide training institutes). The refreshers are an effective way of standardising the quality of the shebikas’ performance and of keeping them updated on current laws. Now a new 12-day HRLE curriculum is being rolled out countrywide, phasing out the previous 22-day curriculum. The 12-day course shifts the paradigm from a purely legal literacy focus to one of rights articulation. The launching pad of the HRLE curriculum is a situation or entitlement (such as property rights) around which there are discussions of laws, policies, and procedures that support access to justice. Topics in the new curriculum include ‘my family, society and I’, ‘abuse’, ‘gender discrimination’, and ‘procedural legal terms’ such as General Diary (GD), First Information Report (FIR) etc. The classes also include exposure visits made exclusively by OBC members on the 12th and final day of the course. Visits are made to police stations, the government land office, and Union Parishad or Union level local government office. These visits are intended to demystify government bureaucracy and procedures essential to accessing legal support and justice for the underprivileged. The barefoot lawyers have been retrained in the unique teaching method and issues embedded within the new curriculum so that they may instil rights awareness and curiosity within grassroots communities more effectively. This strikingly novel teaching technique incorporates a problem-solving approach to legal literacy by centring the rights-based curriculum in the context of the social and economic profile of participants. HRLE students are encouraged to identify barriers preventing them from seeking justice and are guided to think strategically to overcome them. The main props to engage participants in this interactive session include a large poster titled ‘Ami Ke’ or ‘Who Am I’, designed by the programme. The poster shows an image of a large circle which is divided into three levels/social strata and categorically coloured to distinctly portray these three layers. The outer most circle coloured purple represents the national, district, and/or Upazila level. The inner circle, coloured magenta depicts the Union level, and the inner most circle, coloured green covers the family/household level. Small picture cards showing men and women in various professions are also used as cues. 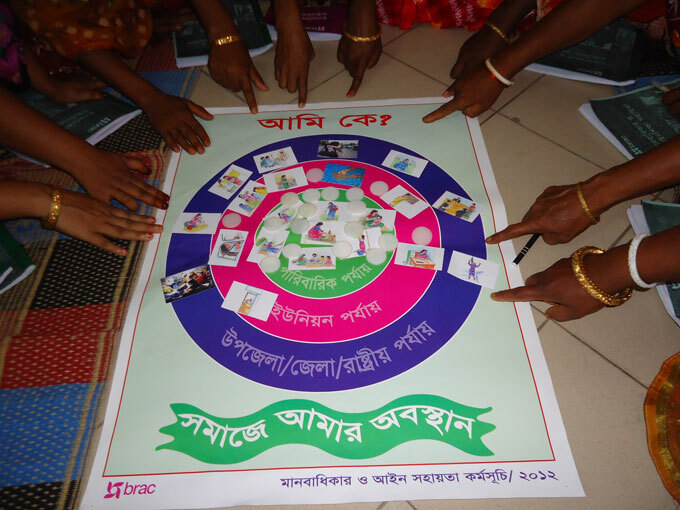 In an ideal HRLE class setting, shebikas will roll out the above poster on a mat covering a mud floor in front of their students who usually sit in a semicircle; she will prompt some of the participants to place the picture cards within each of the three circles on the poster according to feedback from the remainder of the class. Once this process is complete, students will be given white coloured circular counters which they are asked to place on the poster according to their individual perceived social status. The HRLE shebika will then go around the class to find out some of the reasons behind students’ selected tiers as indicated in the poster. The barefoot lawyer then goes on to ask how participants think the people shown in the picture cards may have reached their chosen professions or positions in society. She also asks if the women in her class feel that they have the potential to reach any of the poster’s outer circles and attempts to brainstorm with the participants as to the barriers that may be preventing them from doing this. The shebika supports these ideas by prompting the class to come up with solutions as to how society can aid them to improve their perceived social status. The shebika ends the class by motivating participants to value their work (even if they belong to the household level) and encourages them to continue to explore their own potential in the practical world. Through this path-breaking pedagogy, HRLS hopes to create independent thinkers who will be motivated to stake their claims and explore new gateways to legal empowerment in a just and equitable society. 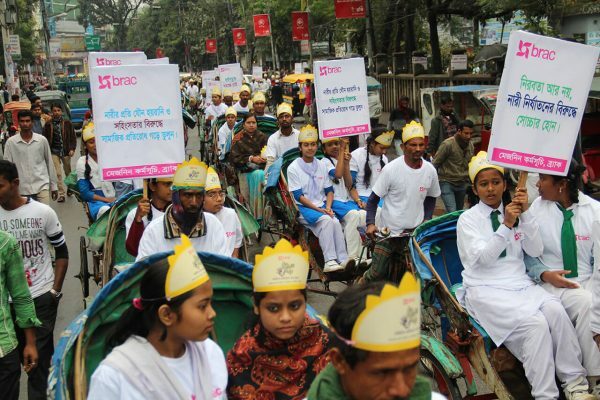 BRAC is doing great job in our rural area. They take some great steps to improve our education system. This is really wonderful.